David Flick, Principal and Founder, announces that the firm successfully completed Section 404/401 Clean Water Act permitting for the Woods at Prairie Haven Residential Development in Olathe Kansas. The development will help meet the demand for residential homes in western Johnson County. Scientists with Terra Technologies completed a jurisdictional assessment of potential waters of the United States and to document existing site conditions. The development is approximately 19 acres in size and consists of forested land. 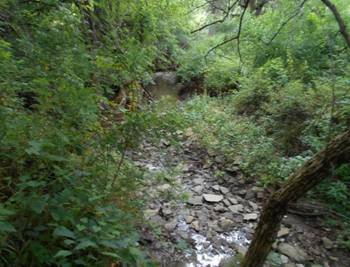 A total of 462 lineal feet of ephemeral stream and one intermittent stream totaling 2,064 lineal feet were delineated on the property. The Corps of Engineers waived the 300 linear foot limit and has determined that the adverse environmental effects of the project are minimal. The permittee received a Nationwide Permit 29 verification letter authorizing unavoidable impacts to jurisdictional surface waters. To replace the lost aquatic resources resulting from site grading, mitigation credits will be purchased from the Kansas/Missouri River Wetland and Stream Umbrella Mitigation Bank. The compensatory mitigation credit purchase must be completed prior to the commencement of work within the regulatory jurisdiction.